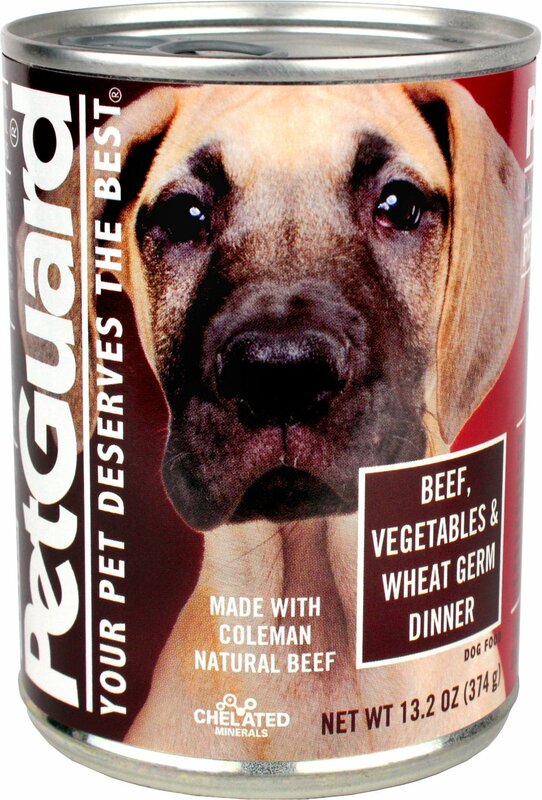 Serve your dog a complete and balanced meal with PetGuard's Beef, Vegetable & Wheat Germ Dinner. This first-class recipe is crafted with high-quality ingredients like beef broth, beef, chicken, chicken liver, wheat germ, peas and more. It's also completely free of those not-so-desirable ingredients you want your dog to avoid like animal by-products, artificial flavors, colors, preservatives, sweeteners or sugar. And with vitamins, chelated minerals and healthy omega-3 and omega-6 fatty acids, every bite is formulated to help support your dog’s heart, kidneys, liver, skin, coat and overall health. This family-owned business is focused on quality and natural nutrition made right here in the USA. Specially made with Coleman natural beef which is free-range cows fed a vegetarian diet and raised without hormones or antibiotics. Completely free of animal by-products, carrageenan, corn, soy, artificial flavoring, artificial preservatives, artificial colors, added sugars or sweeteners. Proudly made in the USA from ethically sourced USA ingredients. Omega-3 and omega-6 fatty acids help promote healthy skin and a lustrous coat. Recommended by veterinarians to provide dogs with a 100% nutritionally complete and balanced meal with chelated vitamins and minerals to help support their overall health. Beef Broth, Beef, Chicken, Chicken Liver, Wheat Germ, Peas, Carrots, Potatoes, Brewers Dried Yeast, Tricalcium Phosphate, Guar Gum, Potassium Chloride, Salt, Choline Chloride, Yucca Schidigera Extract, Dried Kelp, Zinc Amino Acid Chelate, Iron Amino Acid Chelate, Menhaden Fish Oil (Preserved With Mixed Tocopherols), Vitamin E Supplement, Copper Amino Acid Chelate, Manganese Amino Acid Chelate, Sodium Selenite, Thiamine Mononitrate, Cobalt Amino Acid Chelate, Niacin Supplement, D-Calcium Pantothenate, Vitamin A Supplement, Riboflavin Supplement, Biotin, Vitamin B12 Supplement, Pyridoxine Hydrochloride, Potassium Iodine, Vitamin D3 Supplement, Folic Acid. The age, size and activity of your dog are factors in the quantity of food necessary for your dog's good health. Provide fresh drinking water at all times. Refrigerate any unused portion. Whenever in doubt consult your veterinarian. For puppies, feed 2 times daily. For gestating & lactation, feed 3 times daily. Slowly transition your pet by mixing the new entrée or recipe with your dog's current entrée or recipe over 5-7 days. Continously increase the amount of PetGuard food while decreasing the amount in your dog's current diet. Once the transition is complete, you can rotate between our entree's and dinners without a transition period, unless your dog has a certain sensitivity. According to the USDA and FDA, it is illegal to use or promote the use of the verbiage "human grade ingredients" because there is no legal term as "human grade". PetGuard uses ingredients that we would eat ourselves. The best ingredients that PetGuard uses in the foods we bring to your pets are the result of 25 years of working with our suppliers and careful monitoring of the quality demanded for products manufactured to our specifications. You want to give your dog the nutrition he needs to feel his best, and he wants to dine on whatever tastes best. That's why PetGuard chooses only the freshest ingredients to create meals that aren't just tasty—they're good for him, too. Each delectable entree is rich in vitamins, chelated minerals, taurine and omega fatty acids, plus bursting with the flavors he loves. It's a win-win! PetGuard strives to make the best food possible with the best ingredients possible. They source responsibly, using antibiotic-free, hormone-free and free-range beef, plus cage-free chicken, turkey and New Zealand lamb. That's a lot of the word "free," but that's because PetGuard doesn't subscribe to the normal pet food philosophy. They're paving their own, pure path to tastiness. Every dog has different needs, but with a wide assortment of recipes, PetGuard has the paw-fect meal for everyone. Their LifeSpan formula provides balanced nutrition for canines of all ages, for example, while other, special formulas are designed for pups with sensitivities. From vegetarian feasts to turkey stews, you're sure to find a flavor he'll love that offers the targeted nutrition he needs. PetGuard is seriously committed to the health of pets. So, you won't find any artificial ingredients, colors, preservatives or flavorings in their meals—no added sugars, salt or rendered animal fats, either. Instead, you'll find a perfect balance of protein, fat, and carbs. Every meal is made with wholesome ingredients you can be proud to feed your best friend every day. 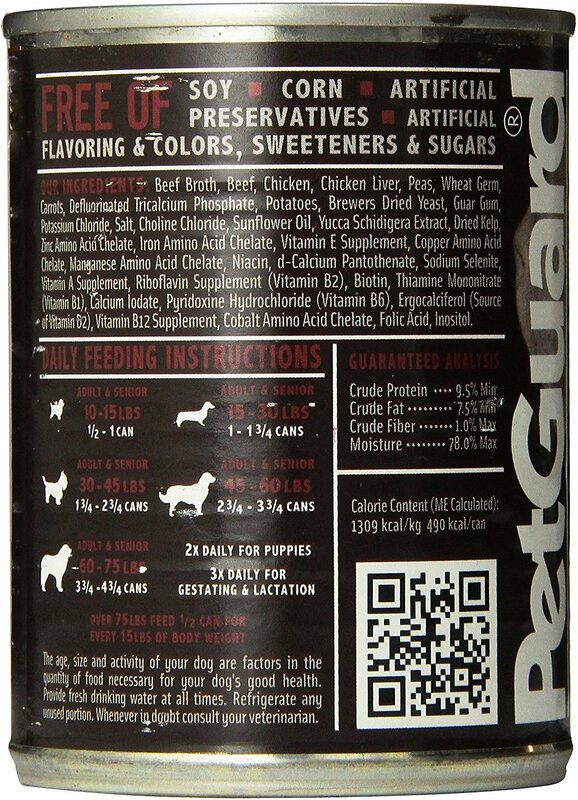 Im thrilled that Chewy is now carrying PetGuard food because it is the best and healthiest formulation on the market. My dogs coats are so shiny, they have energy, great digestion, bright eyes etc. 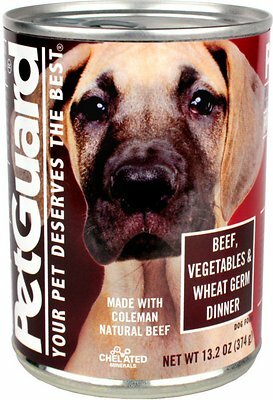 Ive been feeding them Petguard for about six months after years of another premium food and I can tell the difference the food has made. Thank you PetGuard! 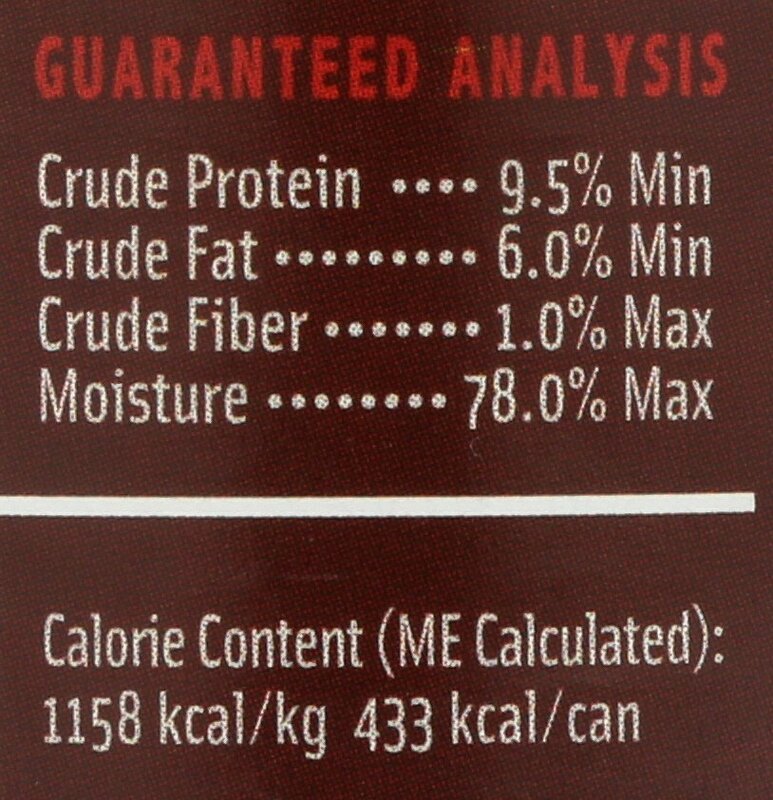 Excellent dog food at a fair price! Good ingredients, not fad ingredients.